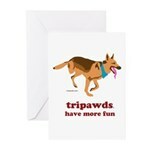 Some of the most cherished memories we share with our Tripawds happen in the great outdoors. Now you can honor those good times with a beautiful outdoor garden stone pet memorial, made by Tripawds member Riley and his artisan pawrents, Kurt and KaCee. 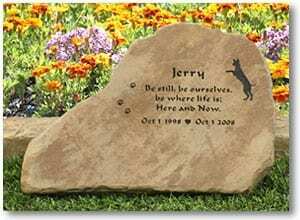 These elegant stone memorials can be customized with your Tripawd’s name and a few lines of text. Choose from pedestals, benches or headstones made with flagstone or rustic rock that endures for generations. 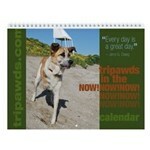 Each item can be tailored to remember a front or rear leg tripawd. 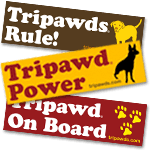 For every memorial sold, Kurt and KaCee are generously passing along 15% of the purchase price to Tripawds.com to help defray the costs of maintaining this free community of support for those facing a cancer diagnosis or amputation for their dogs. 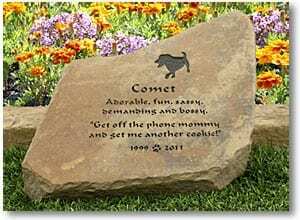 No coupon code is necessary, simply email Kurt Nord at Garden Stone Pet Memorials! Place an order to honor your three-legged hero knowing that your purchase helps support the Tripawds community! These stone memorials are now available on the Remembrance page here in the Tripawds Gifts blog, along with wide selection of elegant pet urns, memorial boxes, lockets, and other items to honor lost loved ones.